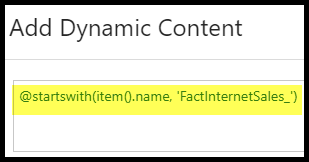 What is the Filter activity in Azure Data Factory? The Filter activity applies a filter expression to an input array. Understanding that definition will help simplify how and where to use this activity. Let me set up the scenario for you. 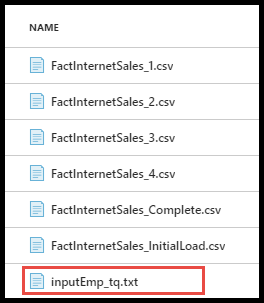 In this example, I want to use Azure Data Factory to loop over a list of files that are stored in Azure Blob Storage. I am going to use the Metadata activity to return a list of all the files from my Azure Blob Storage container. Unfortunately, I don’t want to process all the files in the directory location. Below I have posted the list of files currently in my storage account, notice the file name “inputEmp_tq.txt”. I want to remove this file from the list of files returned. 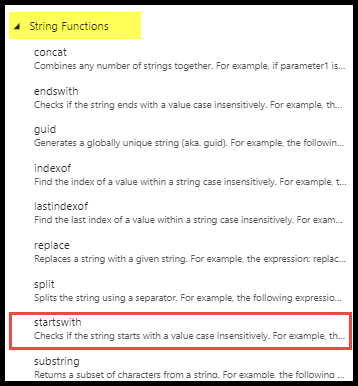 I reviewed the metadata activity in the very first blog post in this Azure Data Factory series, therefore, I won’t bore you with those details again. The dataset is pointing to a folder location, not a specific file. This is important. I selected “Child Items” from the field list properties, this will return the name of all files in that directory location. Now it’s time to set up the Filter activity. The filter activity requires two items during configuration. Items – Input array on which filter should be applied. Condition – Condition to be used for filtering the input array. The items will be the output of our metadata activity and the Condition I will build using the built in expression language. Only items that evaluate to true will be returned in the final array! Next, I will set up a condition that will remove any files that don’t match the naming pattern I want. In this scenario I am simply looking for file names that start with FactInternetSales_ and any files that don’t match this criteria will be removed from the final array. You can see the actual formula in the previous screenshot but I want to quickly show you how I found the function used for this example. First, I am going to click my mouse cursor in the Condition box and then I will click on “Add dynamic content”. Great to hear, thanks for reading my blog!